We are pleased to announce the release of our first article installment in terra, ConserVentures' journal of exploration, science, and culture. Volume 1, Number 1 (Summer 2011) features Treasures of the Sierra Madre: Science & Culture in Sonora, the story of a scientific expedition deep into the heart of Mexico's most storied wilderness. 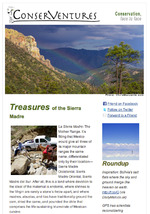 terra articles are free in the latest digital formats (interactive PDF and iPad versions), and can be ordered for nominal fees from our print partner, HP MagCloud.com. At years-end, members, donors, and volunteers will receive a special print compilation of all collected articles plus additional content. Read more here, including how to download the latest articles.